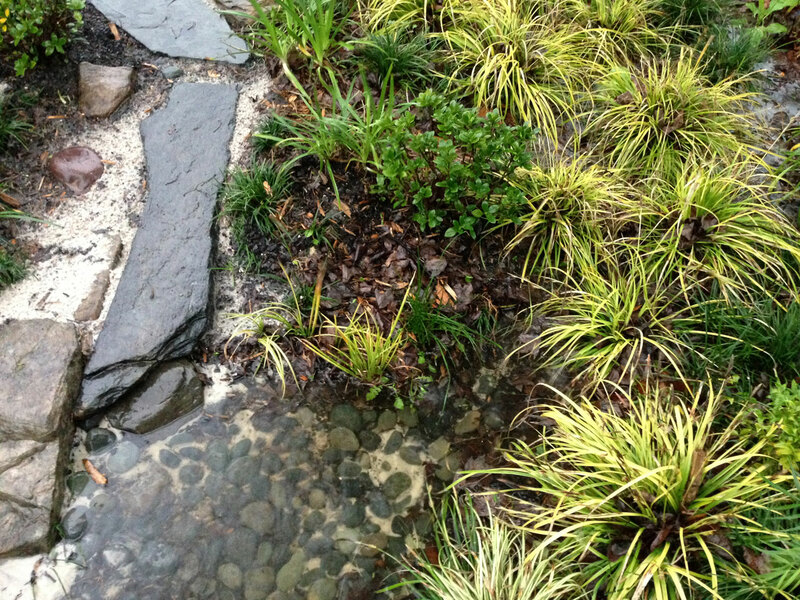 During a rain, dry creek beds collect and channel water. Good question. A dry creek bed is a glorified and gussied up-ditch that collects and diverts rainwater away from your home. When done well, a dry creek bed will prevent erosion, flooding, poor-drainage, boredom and a variety of ills that may befall an unfortunate homeowner. The real reason you want one, however, is because you secretly still crave the puddles and brooks of your childhood and can’t justify making canyons in the dirt with a garden hose anymore. If you’ve ever enjoyed dipping your toes in water or watching leaves float down streams, (be honest, I won’t tell) you need a dry creek bed. 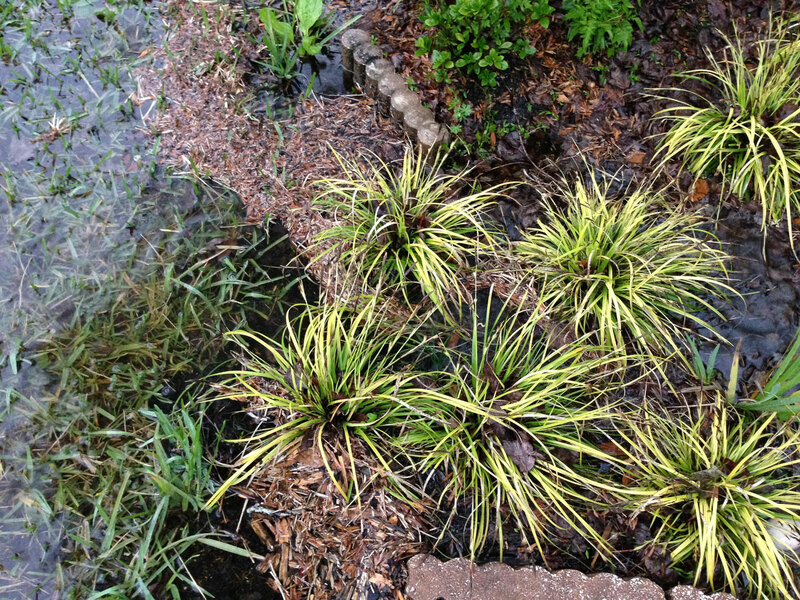 Plants prevent erosion and look purdy. Much of the debris is caught by the plants as it enters the dry creek. If you’ve ever seen a stream or dry creek bed in real life, you would have noticed that they’re made all the more beautiful because plants like to grow in and around water. 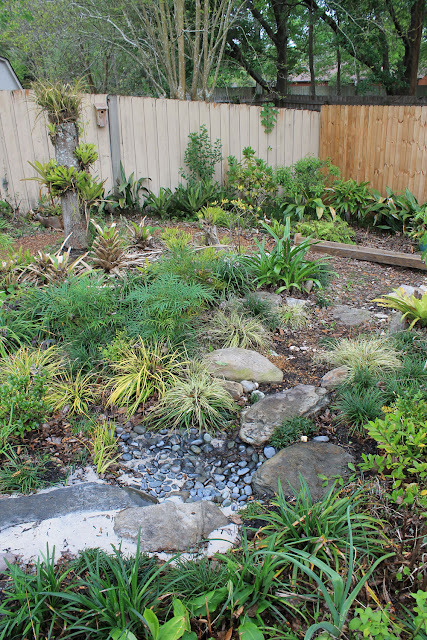 You could tuck some ferns on the downstream side of boulders, or go all out and treat the dry creek as a rain garden, complete with masses of plants and multiple tiers to absorb as much water as possible. Notice how the soil washes away in the unplanted area to the left. 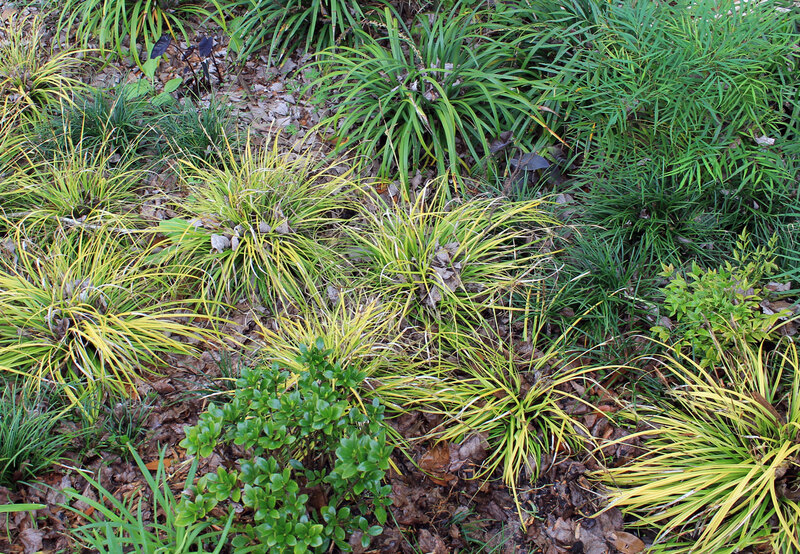 Another benefit is that mass of groundcovers (like the ‘Evergold’ and 'Everillo' sedges pictured) will filter silt and other debris, preventing erosion of your valuable topsoil. A dry creek must always follow the slope. 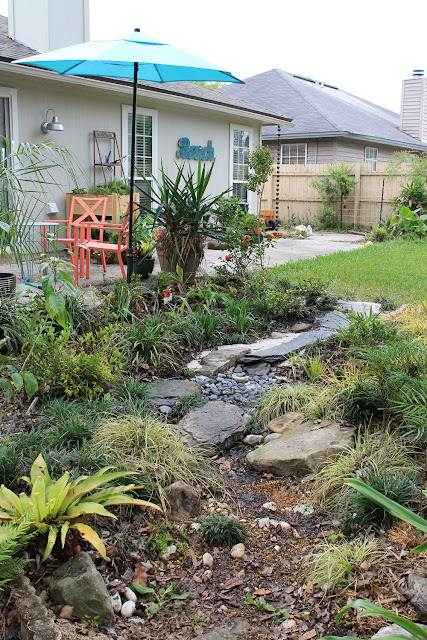 If your yard slopes in one direction, it’s usually best to just go with it… that is, unless your house is downstream. 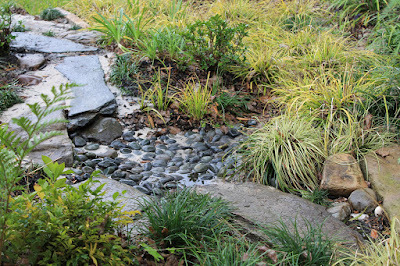 (Then you gotta take it to the street) Feel free to add curves to the flow by adding planted berms or boulders, but just remember that even if you’ve made a pretty ribbon for it to follow, water will always take the path of least resistance. Sometimes all of the gravel and rocks added to make your creek will raise it up higher than the surrounding land! All of the runoff exits here, so I keep it clear. Later I'll add river rocks. 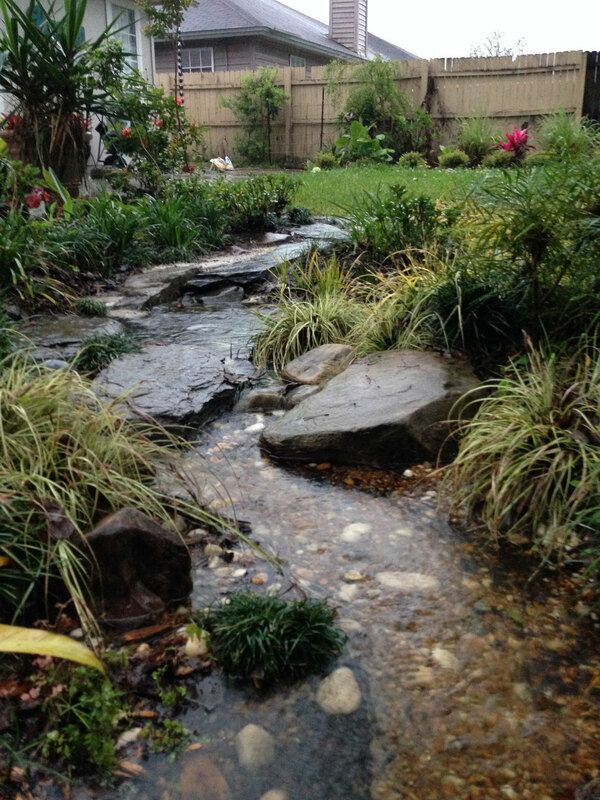 For a dry creek bed to work, it has to perform just as well in the event of flooding. 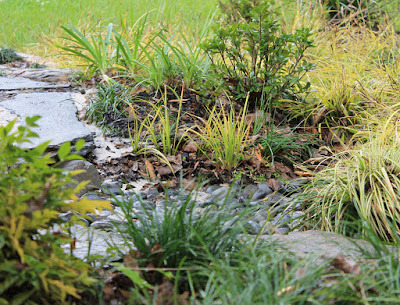 You can direct and slow the water all you want, but always make sure that it has a quick and easy path away from your house. In my case, it’s a storm drain outside my property. 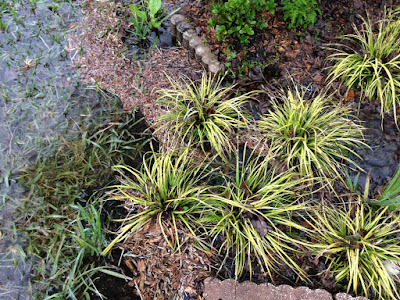 Also, make sure that your paths and delicate plantings stay high and dry in such a situation. I speak from experience on this one. 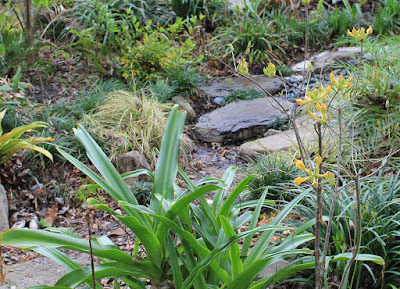 In a real-life situation, plants grow around the watercourse, making it disappear behind shrubs and reappear around boulders. 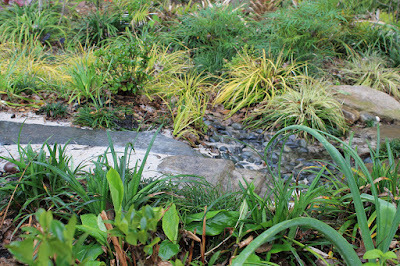 The stream itself would also be hidden from view much of the time, offering a rewarding view as you continue down a path. Be sure to plan these views accordingly, as if they were paintings. These are the vistas. 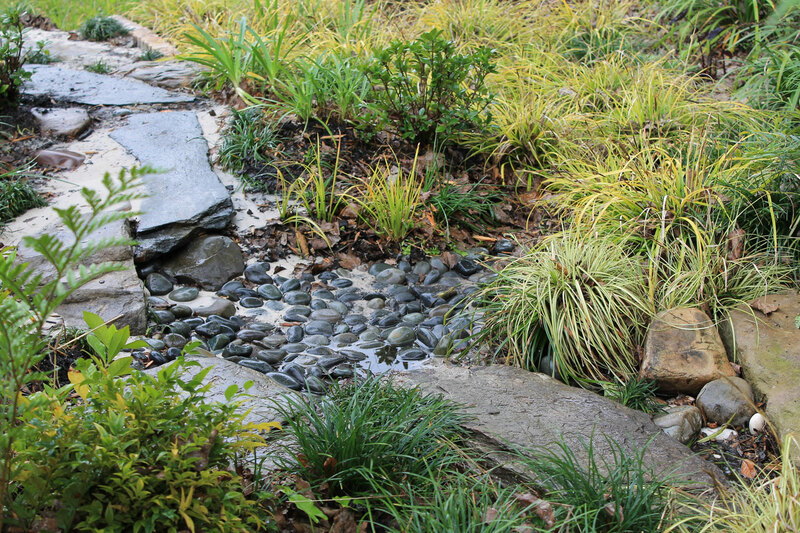 It’s tempting to add a raucous planting of blooms and foliage to the area around your dry creek bed, but consider this: Do you really want to distract from that beautiful stream running through your backyard? 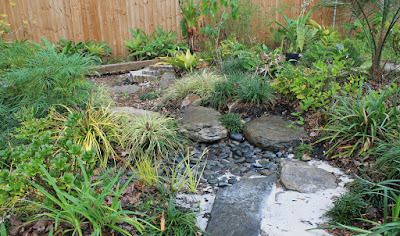 Take a Zen approach and use only a handful of plants that loosely follow the flow of the stream. Note how the stones are nestled into the hillside. Rule of thumb: If your landscape is flat or rolling, use flat or rounded sedimentary stones that would normally be found in low-lying areas. 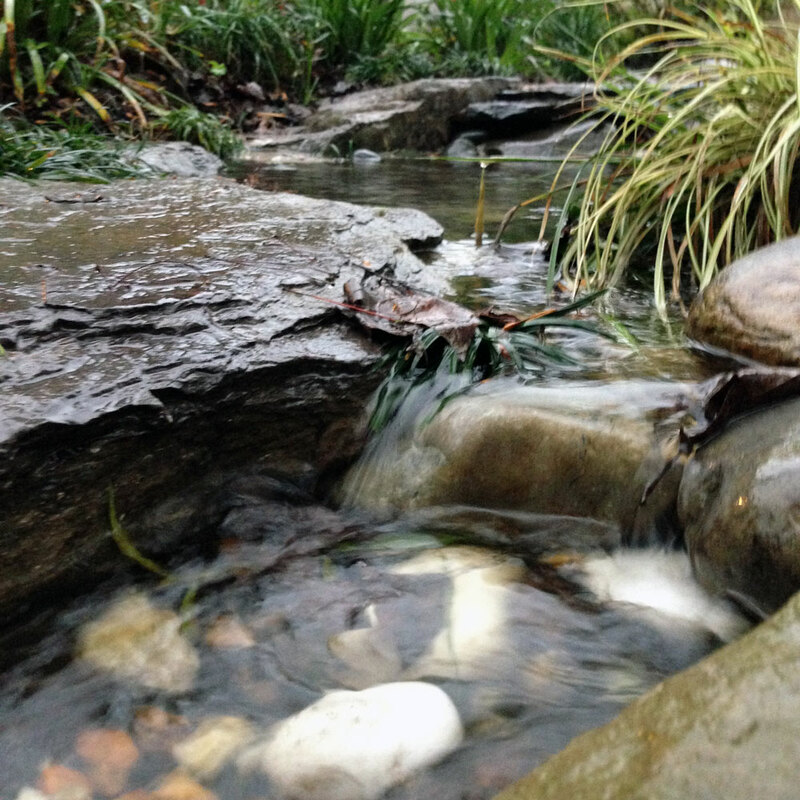 If your dry creek bed will be plummeting through a steep terrain, igneous and metamorphic rocks may be used. Simply put, use what looks natural. When placing the stones, avoid symmetry and be sure to nestle them into the ground as if they were found there. 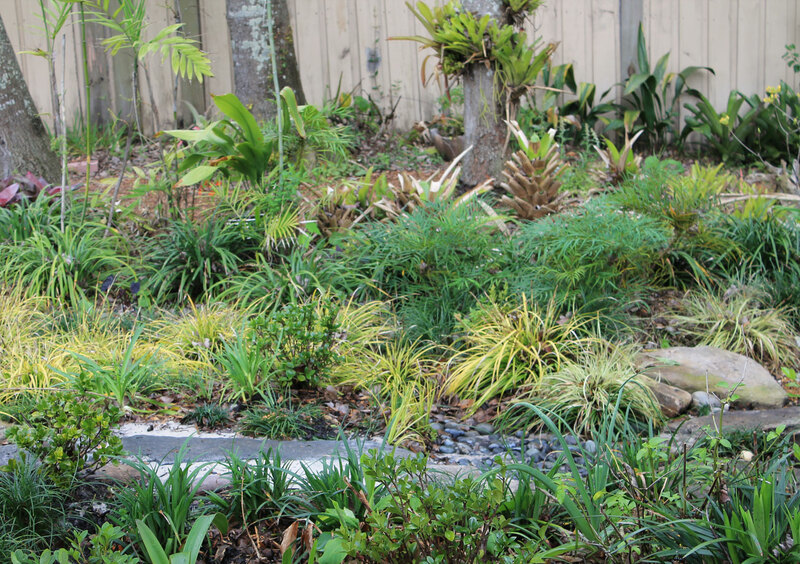 Use an assortment of sizes, placing larger ones along the sides of the bed and gravel in the middle. Oh, and flat stones placed on end look like tombstones. Don’t do it. This is the view from the patio. Allow an open view of your creek bed from your favorite places to sit and reflect, be they windows or seating areas on the patio. Frame the views with taller plants to each side, leaving low-growing ones in the center (though there’s no need for symmetry) so that they don’t become that tall guy in front of you at the movie theater. 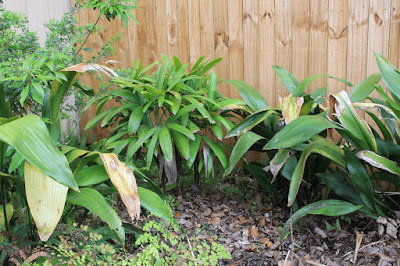 Also consider using plantings to conceal any eyesores or distractions in the garden. Groundcover plants also prevent weeds. 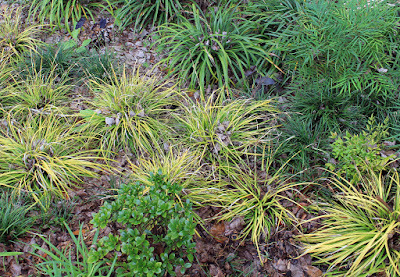 Mulch is the usual go-to for weed prevention, but after heavy rains, the commonly offered bark nuggets or bark either float away or collect to form dams. Besides, it looks tacky next to all those cool rocks. 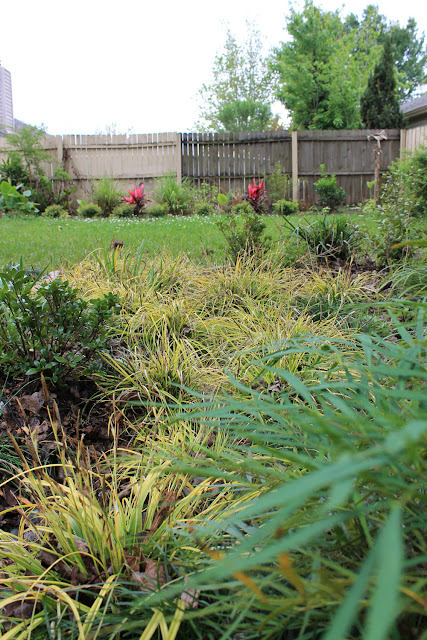 Pine straw and raked leaves, on the other hand, look natural in planted areas and do not create a barrier to your stream’s flow. 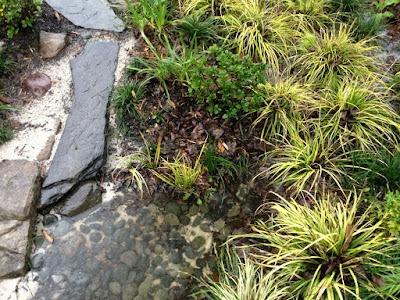 To prevent weeds beneath gravel and small rocks, use landscape fabric (the only place it’s good for) or line with flat rocks. It's hard to tell, here, but the gardenias and other shrubs will be pruned in low mounds. 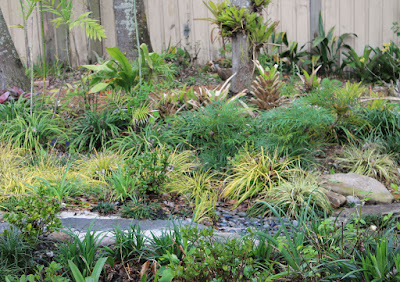 If your creek has gentle curves, use plants with naturally round or mounding forms. Going for a more dramatic, jagged look? Incorporate exciting architectural plants like Yuccas or Cannas to bring height and flair to your bed. Okay, I lied. Texture is also important, so soften the harsh edges of rocks with soft-texture plants like those with grassy textures, or those with really fine texture like creeping thyme. This is where my son will have endless adventures. 10. Make it an Adventure! A week or so ago, my wife casually mentioned that I should put a path into the rain garden so that our son could easily and cleanly cut across. "I don't know, maybe stepping stones." She would say to me, as if it wasn't a big deal to cut a path right through the focal point of the garden. At first I was skeptical about changing up my carefully-planned design, but when I watched my son awkwardly flail about in search of Easter eggs (It was Easter) I started to feel bad for the little guy and reconsidered. So I added a path and made it fun: With stepping stones for hopping, steps for climbing and a pebble-lined pool for mud-free splashing. I’ve also given the little pool a lip of dwarf mondo grass so that a little water always sticks around for a while before draining away. The 4x4 is where I'll build a bridge. Dry creek beds allow you to play in the dirt and puddles. Why would you ever want to hurry up and call it finished? I've been working on mine since moving in two years ago and hope that I'm still tinkering many years from now. Feel free to shoot me an email (steve_asbell - at - yahoo.com) or leave a comment if you have any questions or want to share your own dry creek bed! Here’s an earlier post I’ve written on the subject. My how it's grown!